Angelique Palmer is a poetry slam doyen, a finalist in the 2015 Women of the World Poetry Slam and a member of The Beltway Poetry Slam Team in 2017. The Creative Writing graduate from Florida State University now calls northern Virginia home. She’s penned more than a dozen self-published chapbooks as well as THE CHAMBERMAID’S STYLE GUIDE, the full-length book of poetry on Sargent Press. She's a 2018 Colgate University Writing Retreat Resident, a 2017 Fellow of The Watering Hole, a 2015 A ROOM OF HER OWN writing retreat new recruit, and a 2014 Pink Door Writing retreat alumna. Her publications include BORDERLINE, THE MUD SEASON REVIEW and WUSGOOD BLACK?. 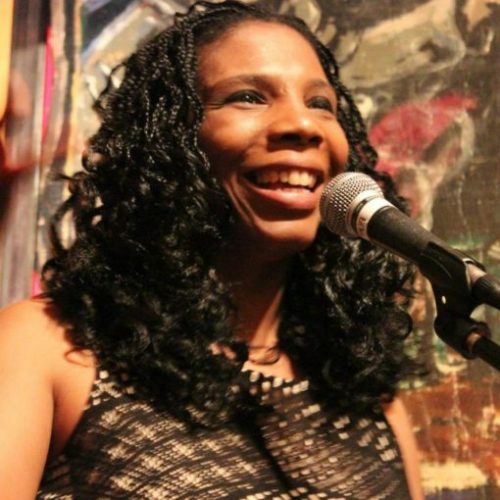 While being the featured poet in more than a dozen cities across the U.S., she is also the co-editor of BEECH STREET REVIEW, the slam manager at The Beltway Poetry Slam and makes her own ice cream. For two hours, audiences can expect a diverse chorus of voices, and a vast array of professional spoken word performers, open mic rookies, musicians and a different host every week. Expect to be moved, expect a packed house, expect the unexpected, but above all come with an open mind and ear. $5 cover. Wristbands are available for purchase online at midnight and in the restaurant starting at 10:00 AM (cash only). No refunds. Ticket purchase limit of 4 per person. Guests must have their wristbands (tickets) on upon entering the event. Seating is available on a first come, first seated basis. No saved or reserved seats are allowed. Failure to check in within 30 minutes of advertised start time may result in forfeiture of seats.